Hello from Blizzardy Boston! Sooooo not happy about this weather; hoping we still get out tomorrow night. 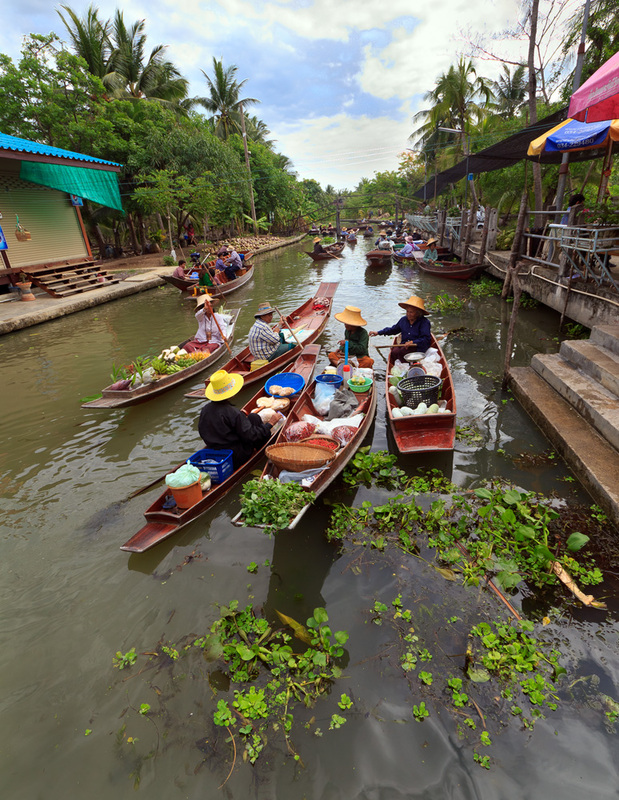 1) Best floating market in Bangkok or nearby area? I'm an amateur photographer so I'd love to get some great photos, as well as experience the market. We are in BKK for three nights before departing for Chiang Mai and Krabi and have reservations at Nahm, Gaggan and Le Normandie however if there's a great dinner/Thai dance that we should go to instead of one of the aforementioned restaurants, we would love any recommendations. For the floating market I like Amphawa Floating Market and not too far from there is a very nice scenic drive through salt farms. Unless you have the whole day I would not advise for you to do both. *Amphawa is close to the marker with the description "6KM AFTER THE BRIDGE". For the classical Thai dancing the Mandarin Oriental has a riverside restaurant on the opposite side of the river to the hotel with good Thai food as well as authentic Thai classical dancing. Out of your list I would forgo Le Normandie as I am sure you can find good French in the US. OK I found a better link for both Amphawa and the scenic drive. They are number 51 & 52 on the CNN list. Great - thanks so much, Hanuman! I second the place Hanuman recommended (. Sala rim nam) you probably need to book ahead. Food was lovely and the dancing really good. Nahm and Gaggan are fantastic, enjoy! hanuman, just in case i'm in the neighborhood, where can i buy the salt from the salt farm? kuranosuke you can buy the salt from me! Just need to know if you like your salt "infused" with black or white truffle? Salt - a couple of years ago we stopped on the route to buy 2 500gm packets of salt and packed it in the suitcase. At the airport on arrival we were asked to open up and take them out for inspection - apparently salt shows opaque in bag x-rays due to high metal (sodium) content!!! Anything opaque usually triggers a full inspection, just be warned. In the greater Amphawa area, I found that Tha Kha is my favorite market. It's much less crowded, much less "touristy", and has a real rural feel to it. Quite photogenic. My last trip to Amphawa, last month, was a real disappointment. It seems like it may have become too famous. It was very crowed and many vendors have now severely encroached on the limited boardwalk. Many times the were spots that became blocked for a period. This was on a Sunday evening (Amphawa is considered an evening market). Both these markets are weekends only. Damnoen Saduak is the most famous of the floating markets. If you search for images of "floating markets", most will be taken at Damnoen Saduak. It is, indeed, the "poster child" of floating markets. Damnoen Saduak is often panned, due to the fact that it is "too touristy". Personally, I find it no more touristy than Amphawa, and a lot more photogenic. Two big advantages of Damnoen Saduak are that it is open 7 days and has dozens of tours heading out, daily. Two nice markets, closer in to Bangkok, are Bang Nam Pheung and Klong Latmayom. Bang Nam Pheung is just south of the city , in the Phra Pradaeng District. It has a very rural feel and is still pretty much off the foreign tourist radar. Klong Latmayom is west of Bangkok, around Bang Ramat / Taling Chan. It's a huge, klongside market, with some of the friendliest people we've encountered during out floating market visits. Both these are also weekend markets. Thanks,Curt - great shot and awesome info. Much appreciated! Sméagol - thanks to you, as well! bon voyage. lovely sunny day in boston today..
have the tasting menu at gaggan and a couple of exotic drinks.. hope gaggan is there that night---expect the dinner to be slow..
Did you sit on the floor Bob? We had those seats where you feet "dangle" below you so didn't find it uncomfortable at all! Agreed about the tasting menu at Gaggan. It's more than a restaurant, it's an experience!